Fashion has a life-cycle of approximately 6 months. This is not always the case with every collection, especially with designers producing transitional resort collections in-between the ready-to-wear and couture offerings. This has created an opportunity for you, the consumer, to adapt in an aptle manner, allowing you to stretch your budget and style, across a twelve month period without feeling the out-of-style pinch. In this post, I present to you three transitional macro-turned-micro trend looks/items that landed during spring-summer 2017 and are likely to stay relevant going into spring-summer 2019. First up, we have the Boiler suit. Generally called a jumpsuit for fashion purposes, this item is usually loosely designed and tailored to create a comfy form with a general one-cut-suits-all fit. In its essence, it’s a great wardrobe essential as you can wear it to work and on the weekend, based on how you accessories, maximise and complement it. 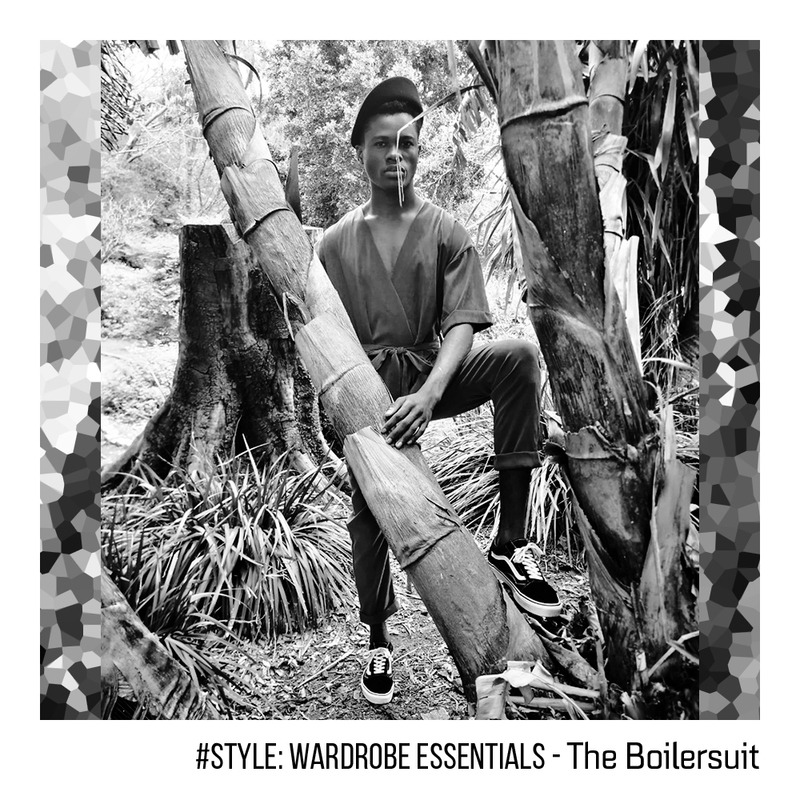 In the version presented, South African Fashion Designer, Lukhanyo Mdingi, adds a Japanese-inspired, Kimono-like twist to the boiler suit, allowing it the freedom to stay casual chic while taking on a high-end designer aesthetic. With shortened sleeves and cropped tapered legs, it does suggest warmer weather indulgences, however, you could slip a dinner shirt underneath with a pair of graphic sock and platform brogues for a more evening-chic look on chilly days or nights. The idea suggested, is to find a boiler suit in a neutral cross-over colour, in a hassle-free fabric that has a modern cut with a finished aesthetic, in order to stay trendy while maintaining modern tastes. Uthman wears boiler suit by Lukhanyo Mdingi with beret by Crystal Birch and sneakers by Vans. Photographed and Styled by Monde Mtsi. 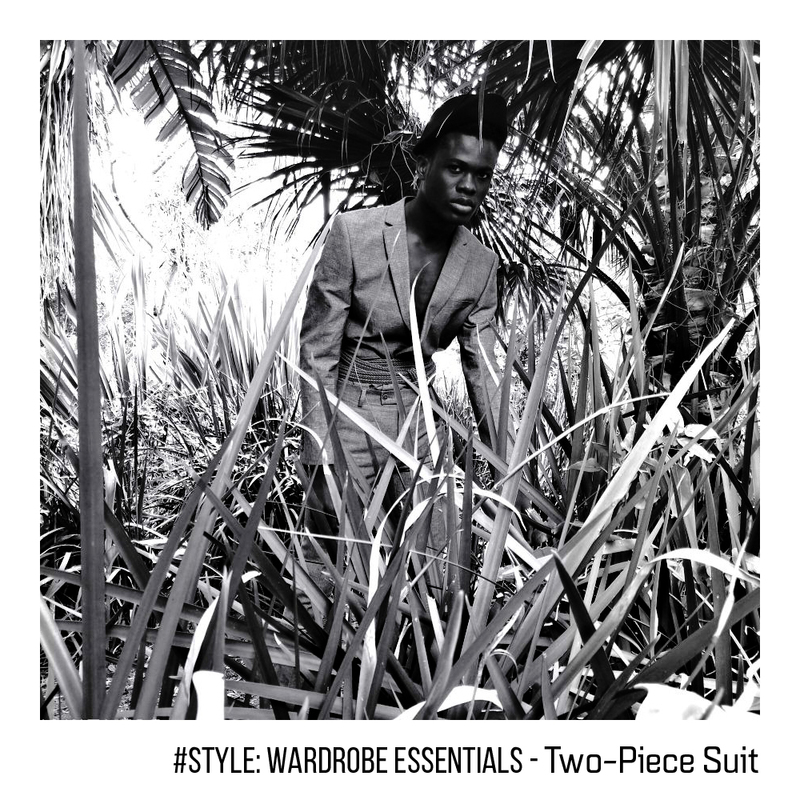 The Two-Piece Suit, a general staple for any man anywhere in the world, is our second offering of what you should get for your wardrobe to ensure your essentials are in check. Single-breasted is the formal and standard option, the most of classic of them both, while double-breasted is considered a much more fashion-focused option. Also, double-breasted requires a specific physique due to its cut and sometimes certain bulk body types don’t look appropriate in a double-breasted blazer. Photographed here, Uthman wears a single-breasted two-piece suit in grey by David Jones from Woolworths. The key details to look out for are the centre-darts on each side of the blazer; these indicate that the blazer has been shaped to cinch closer to the body from your upper waist, just below your chest. Your lapels should be slim and slightly elongated to give your upper body additional length and the sleeves should be cropped low enough only to reveal about 1-2cms of your shirt. Your trousers should four pockets: two on the sides and two at the back; and your trouser length should be cropped just enough for your socks to peak through in between your hemline and your shoes. Start off by buying this suit in a classic colour: navy, black, grey, charcoal or royal blue. Once comfortable, start exploring bolder colours and prints in the same cut. Remember to maximise on this look by pairing it with crew-neck jumpers or golf shirts or even a plain white or black tee for a more smart-casual look. Uthman wears two-piece suit in Grey by David Jones with woven-leather belt in Tan by Studio W both from Woolworths. Beret by Crystal Birch and sneakers by Vans. Photographed and Styled by Monde Mtsi. For the active wear lovers, The Sports Luxe Jacket is our final offering for this wardrobe essentials segment. The athleisure or sports luxe trend has been gaining momentum more and more ever since the world realised wearing yoga pants in public was a thing. Now, brands the globe over are increasing fusing high-fashion design principles with practical, technical sportswear techniques. One of the best pieces to come of out this has been the sports jacket. With its versatility in any territory unparalleled, it continues to prove its pivotal role as a wardrobe staple for any season. In this picture, Uthman wears a silver-coral sports luxe jacket from DIESEL. Its cut is based on a standard baseball jacket, its finish on technical specifications for longevity and practicality and its style on the growing trend for fusing fashion with graphic elements as a post-modern take on bridging the dive between millennials and Gen Xs. The great thing about a sports jacket is you can wear it on its own or pair with a formal look to give it a bit of street cred. Also, if combined correctly, your sports jacket could form part of a formal ensemble for chic evening gatherings. Or you could just pair it with sneakers and jeans and go bowling with the boys. 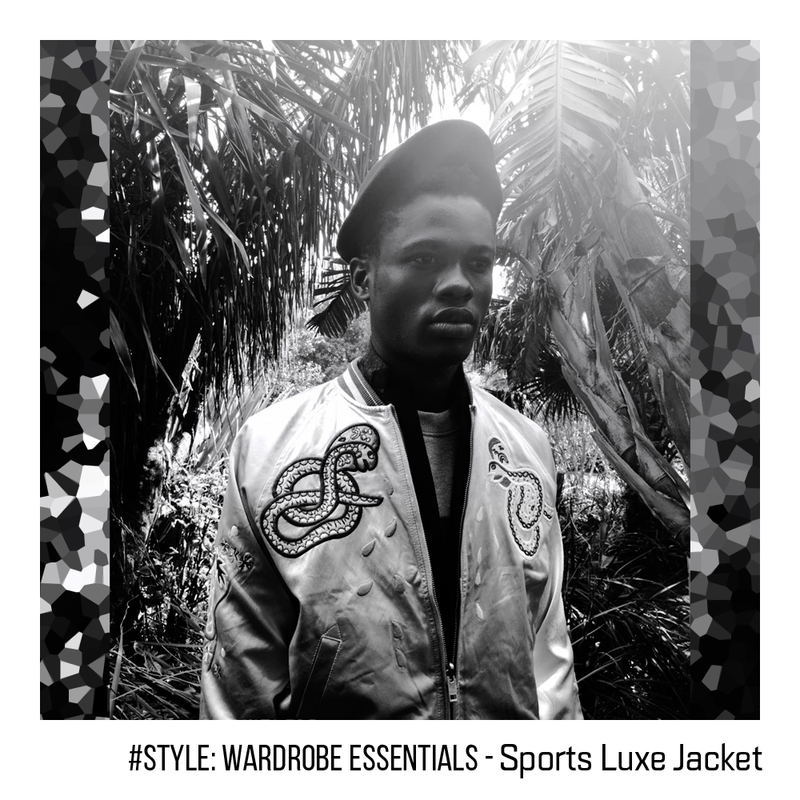 Uthman wears Silver graphic luxe sports jacket by DIESEL. 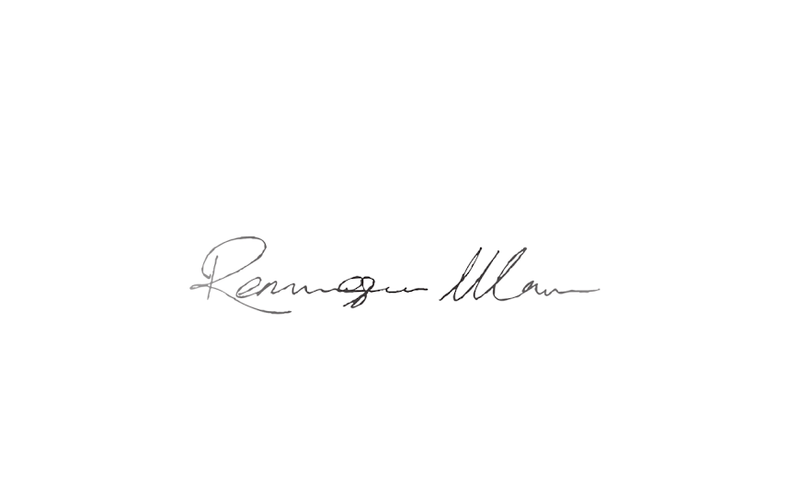 Underneath, he wears a black two-piece suit by Burberry with a grey crew-neck jumper from DIESEL. Beret by Crystal Birch and sneakers by Vans. Photographed and Styled by Monde Mtsi. Remember: Fashionable doesn’t always mean seasonal and neither does trendy. Be a little over critical and ask yourself, ‘as trendy as it looks, will I be able to wear this three years down the line without second-guessing myself?’ If you struggle to come to an answer or you agree you won’t wear it in three years’ time – don’t buy it. It’s always great to have fashion pieces that you use as talking points but no one wants to have a clogged up wardrobe with items you never wear because they are past their wear-by date. If you’re keen but unsure, ask a friend or get it in a neutral colour to avoid complicating your wardrobe. It’s easier to dress up something plain, modern and classic than it is to dress down couture.